A South Korean court jailed former President Park Geun-hye for 24 years on Friday over a scandal that exposed webs of corruption between political leaders and the country's conglomerates. The court also fined Park, the daughter of a former military dictator, 18 billion won or 16.9 million dollars after finding her guilty of charges including bribery, abuse of power and coercion. 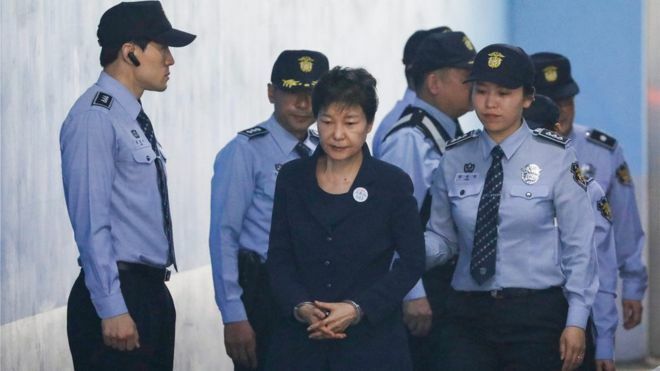 South Korea's disgraced former president Park Geun-hye is jailed for 24 years Friday for corruption, closing out a dramatic fall from grace for the country's first woman leader who became a figure of public fury and ridicule.